The beautiful Eastern Pine Elfin falls into the pine-feeding group of elfins, which some authors formerly put in a separate genus Incisalia. Our Eastern Pine Elfin has traditionally been considered quite distinct from the Western Pine Elfin (Callophrys eryphon), but there are northern bogs from Maine to Michigan and through Canada where the two species co-occur and may possibly interbreed (Robbins 1994). The Bog Elfin is our other pine-feeding elfin. All Massachusetts elfins remain in the genus Callophrys in the 2008 Pelham catalog, with Incisalia treated as a sub-genus not restricted to pine-feeders (see Hoary Elfin species account). 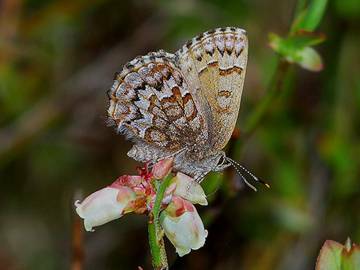 Eastern Pine Elfin was a familiar butterfly in the 19th century. German lepidopterist Jacob Hübner named it Thecla niphon, and John Abbot in Georgia studied its life history. As in so many cases, Thaddeus W. Harris was the first to mention it for Massachusetts, writing that “the Niphon butterfly (Thecla niphon of Hübner)” had been taken at Sweet Auburn " (now Mount Auburn Cemetery in Cambridge), early in May (Harris, 1862: 278; this specimen was not apparently in Harris' own collection, see Index). Scudder decided to put it in a new genus, calling it Incisalia niphon, and wrote that it could be found on or near red cedar, sometimes in pines 30 feet from the ground, or at other times in fields bordering the pine groves, where “a great deal of the herbage was made up of Antennaria plantaginifolia in flower” (1889: 833). He knew of specimens from several locations around Massachusetts (Andover, Boston, Walpole, Middleboro and Cape Cod in the east, and Springfield and Amherst in Connecticut River valley), and viewed the species as common. Maynard (1886) notes that it was “...one of the first of this genus to appear,” frequenting sheltered woodlands in early May. He had found it feeding on the sweet scented flowers of the locust, and observed the see-sawing of the hindwings. Museum specimens indicate that Eastern Pine Elfin was found in most of the usual collecting locations around the turn of the century, and, as Scudder says, it was probably fairly easy to find in eastern and central Massachusetts. At Boston University there is an early specimen from Sherborn (1890, E. J. Smith), and at the Harvard MCZ there are specimens from Wellesley (1891 and 1895), Sherborn (1892), Malden (1895), Wollaston (1883; 1886; 1897); and Waltham (1897). At other museums there are perhaps the earliest specimens from Worcester Co.: Winchendon (1901; Smithsonian), Framingham (1904, BU) and Milford (1903, AMNH), as well as Stoneham (1903, AMNH) in the east. The re-growth of white pine and red cedar in woodlots and old agricultural fields may have helped this species (Table 1). For Cape Cod, Scudder (1899) knew of at least one specimen (collected by Fish), but some of the earliest extant specimens are from Eastham (1922, BU), Harwich (nd. C. J. Paine, MCZ), and a series in the 1930’s from Waquoit Bay, Falmouth (Yale, UNH). Kimball collected it in Barnstable in 1952 (MCZ). Historically, Eastern Pine Elfin was well-documented on Nantucket, but not Martha’s Vineyard. For Nantucket, C. P. Kimball documented the species with specimens from 1937, 1939 and 1941, which are now in the Maria Mitchell Museum on Nantucket (LoPresti 2011). The earliest, and only, specimen from Martha’s Vineyard is one from 1919 at Yale, no collector listed. Eastern Pine Elfin seems to have remained fairly common through the twentieth century. Between 1900 and 1950 there are museum specimens from at least twelve towns in addition to Scudder’s list, including Weston, Wayland, Wellesley and Tyngsboro. Farquhar (1934) lists 15 locations in addition to Scudder’s list, all in eastern and central Massachusetts, including Gilbertville in the Quabbin area. W. D. Winter collected it in Westwood, Dover, Medfield and Plymouth in the early 1970's (MCZ). Between 1950 and 1986 (when the MAS Atlas began), there are specimens from at least 22 more towns across the state. The earliest specimens from Franklin County appear to be those of F. Fee; in 1973 he found niphon “common” on Montague Plains (specimens at McGuire Center, U. of Florida). D. Bowers also found it there in 1976. In "the valley," P. Carey reported “a good flight” at South Hadley on May 11, 1974 and found it again in 1975 (Lep. Soc. Seas. Sum. 1973-1975). There are specimens from the 1960s, 1970’s and 1980s from Amherst and Sunderland. The earliest Berkshire County specimens appear to be two from the 1960’s collected by Rene Wendell, Sr. around Pittsfield on 5/12/1965 and 5/24/1966 (R. Wendell, pers. com. to R. Primack 1/24/2011). The earliest museum specimen appears to be one from Sheffield collected 5/5/1982 (D.S. Dodge, Yale) in the southern Berkshires. The 1986-90 MAS Atlas found Eastern Pine Elfin in ten towns in Berkshire County, but found it uncommon there in comparison to other parts of the state. This elfin’s hosts are various pines, including Pinus strobus (white pine), P. rigida (pitch pine), P. banksiana (jack pine), P. resinosa red pine), and P. sylvestris (scotch pine), as well as Juniperus virginiana (eastern red cedar) (Scott 1986). Red pine, pitch pine, and white pine are native to Massachusetts, as is red cedar, while jack pine and scotch pine are introduced and now widespread (Sorrie and Somers 1999). White pine, pitch pine, and red cedar are the most frequently reported hosts in Massachusetts. Scudder reported Eastern Pine Elfin in association with white pine in Andover, and with red cedar in the Boston area, and among “scrub-pines” in the plains around Springfield, Massachusetts (1889: 833). In 1973 Frank Fee found eggs on both white pine and pitch pine at Montague Plains, and reared them to pupae on both species of pine. He also reared some on red cedar. On Cape Cod, Mello and Hansen (2004) report that it is most commonly found on or flushed from pitch pine. The eggs are laid on fresh needle growth, and caterpillars feed on the needles. The chrysalis is formed in late spring and early summer, and then overwinters. The elfin can be found in many kinds of pine and pine-oak habitats, including sandy barrens. The adult butterfly can often be found nectaring on Gnaphalium or Antennaria (pussytoes). In the 19th century, Maynard reported the use of locust flowers, and Scudder reported that "Mr. Emery has always found the butterfly upon Lupinus perennis" in the scrub-pine plains near Springfield, Massachusetts (Scudder 1899: 833). Eastern Pine Elfin may well be increasing in Massachusetts. A 2012 list-length analysis of MBC sighting data found a 273% increase in sightings of this species between 1922 and 2010 (G. Breed et al. 2012). Chart 29 below also shows an increase over this time period, as well as shorter-term undulating patterns which could reflect normal population fluctuations. Data for 2011 show a movement downward in numbers seen per total trip reports, but for 2012 the index is back up, and the overall trend 1992-2012 is upward. Eastern Pine Elfin has been found in 140 out of 351 towns between 1992 and 2013, and is well-distributed across the state, including Martha's Vineyard and Nantucket. It is not recorded from NABA counts owing to its spring flight period. Eastern Pine Elfin may be somewhat less common in the Berkshires than other regions, as MBC has reports only in small numbers from a few Berkshire towns (Hancock, Williamstown, Savoy, Lee, Washington, Lenox, Egremont, Sheffield, Sandisfield). The 1986-90 Atlas recorded it from ten Berkshire towns, including Mt. Greylock (E. Dunbar 6/10/1988). Sanctuary director R. Laubach lists Eastern Pine Elfin as Uncommon at both Pleasant Valley and Canoe Meadows Audubon sanctuaries in the central Berkshires (Stichter 2005). On Martha's Vineyard, Matt Pelikan’s reports beginning in 1999 may be the first from that island since that single mysterious specimen from 1919 (see above). The 1986-90 Atlas did not find Eastern Pine Elfin there. In 1999 Pelikan and Allan Keith found Eastern Pine Elfins in Edgartown, Oak Bluffs, Tisbury and West Tisbury; whether they had newly arrived, or were simply missed earlier is an open question. Eastern Pine Elfin has been reported from the island in fluctuating numbers every year since (state forest high count 42 on 5/10/2001). The Martha’s Vineyard checklist (Pelikan 2002) lists Eastern Pine Elfin as “common,” and usually found near pitch pine or nectaring on blueberry. On Nantucket, Eastern Pine Elfin was found in May 2009 and May 2010 by Vern Laux. The Audubon Atlas had not found it on Nantucket, but there are good historical records (see above). In 2013, Eastern Pine Elfin was reported for the first time from the island of Nahant, north of Boston (L. Pivacek, 5/5/2013, photo). The outer sections of Cape Cod, and Falmouth, usually report good numbers of Eastern Pine Elfins, but there are fewer reports from mid-Cape towns. Mello and Hansen (2004) mention the railroad grade in Provincetown, the bike trail in Brewster and Harwich, and the power line cut in Eastham as productive locations for Eastern Pine Elfins on the Cape. Wellfleet Bay WS is another well-reported location. Acton/Concord Fort Pond Brook max 10 on 5/13/2008 T. Whelan; Amherst/Belchertown Norwottock rail trail max 9 on 4/28/2006 F. Model; Dover Noanet Woodlands TTOR max 7 on 5/11/2003 E. Nielsen; Falmouth Crane WMA max 9 on 4/28/2013 J. Dwelly and R. Buckner; Harvard Oxbow NWR max 25 on 4/30/2006 T. Murray; Martha’s Vineyard Correllus SF max 42 on 5/10/2000 M. Pelikan; Montague sand plains at Turners Falls max 18 on 5/5/2013 M. Fairbrother; Newburyport Little River Nature Trail max 5 on 5/19/2009 S. Stichter; Petersham Tom Swamp max 13 on 5/26/2008 E. Nielsen; Plymouth Myles Standish SF max 25 on 5/5/2013 B. deGraaf; Royalston Tully Lake max 15 on 5/17/2004 C. Kamp; Sherborn power line max 19 on 4/29/2009 B. Bowker; Stow Assabet River NWR max 22 on 5/6/2013 G. Dysart; Uxbridge West Hill Dam max 14 on 5/15/1999 T. and C. Dodd; Wellfleet max 11 on 5/1/1999 A. Robb et al. ; Westfield pine barrens max 13 on 5/3/2007 T. Gagnon. Eastern Pine Elfin is single-brooded, with one long flight, lasting from the beginning of April through about the end of June. It is “common” from the last week in April through May, and tapers off through June (http://www.naba.org/chapters/nabambc/flight-dates-chart.asp). As the Audubon Atlas pointed out, adults emerge over a somewhat extended period in spring. Earliest Sightings: First sighting dates in recent years are well before Scudder's date of "the last of April." In the 23 years 1991 through 2013, the six earliest "first sightings" are 3/29/2006 Burlington M. Rines and R. LaFontaine and the same date in New Salem, R. and S. Cloutier; 4/2/2000 Topsfield IRWS, F. Goodwin; 4/4/2012 Montague sand plains, R. and S. Cloutier, 4/5/2010 Sherborn power line, B. Bowker; 4/8/1999 Foxboro, B. Cassie; and 4/12/1998 Westfield T. Gagnon. The Atlas early date had been 4/13/1997 Medford, R. Robbins. Latest Sightings: In the 23 years 1991 through 2013, the four latest "last sightings," all of single individuals, are 7/2/1995, Orange, D. Small; 6/28/2000 Northampton Florence T. Gagnon; 6/19/2013 Falmouth Crane WMA J. Dwelly (photo; "worn but hanging in there..."), and 6/19/2006 Ipswich Hamlin Res. TTOR M. Arey. The Atlas late date had been similar: 6/28/1987 Sheffield E. Dunbar. In contrast to Scudder’s observation that this butterfly was "seldom seen in June," sightings of Eastern Pine Elfin in June are actually now the norm. The "last sightings" in 22 of the last 23 years were in June. Flight Time Advancement. Scudder, whose flight times were usually applicable mainly to the Boston area, wrote that this butterfly “does not, however, appear until the very last of April, sometimes not until May; it becomes abundant at the end of the first week of May and continues to fly throughout the month, but is seldom seen at all in June (1889: 833).” If Scudder was correct, then it would seem that the typical flight period of Eastern Pine Elfin has advanced since the turn of the century. Evidence that this butterfly has indeed advanced its flight time, at least during the years 1986-2009, comes from a 2012 study done at Boston University using MBC and Atlas data (Polgar, Primack, et al. 2013; graph courtesy of Caroline Polgar). As the negative slope in Graph 29 shows, Eastern Pine Elfin is flying significantly earlier now than it did in the 1980’s (p = < 0.0001; significant at the .01 level). Using all Eastern Pine Elfin sightings for these years, rather than just the first 20%, gave similar results. According to this analysis, Eastern Pine Elfins were emerging about 9-11 days earlier in 2009 than they were in 1986. Additional analysis of 1986-2012 data showed an even greater flight advancement over that period (Williams et al. 2014). Eastern Pine Elfin is responding strongly to temperature variations in the two months prior to emergence (March, April), varying its flight time according to average temperature. This responsiveness to temperature is an adaptive trait. In the Polgar study, Brown Elfin also showed significant advancement in early spring flight time 1986-2009, whereas Frosted Elfin, Henry’s Elfin, and Hoary Elfin did not show significant advances in flight times over this period. However, additional analyses over a longer time period (1986-2012) found that all ten elfins and hairstreaks examined had advanced flight dates somewhat, with elfins advancing more than hairstreaks (Williams et al. 2014). 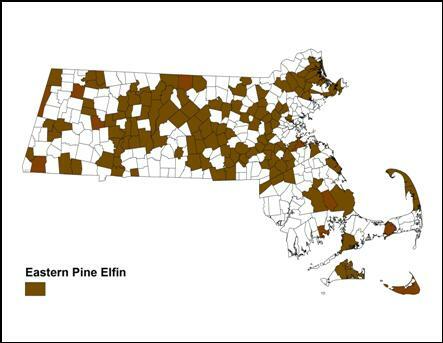 NatureServe 2010 ranks Eastern Pine Elfin S5 or “secure” in Massachusetts and in many other northern tier states and provinces. However, this species may be declining on the southeast coastal plain, for example, it is ranked S3 or vulnerable in South Carolina and Florida.